The Peace box introduces a good variety of instruments including some that younger players might not have tried yet. However, their durability has to be questioned, especially when these are aimed at players who are young and full of beans. But for keen youngsters, this might well fire up a few imaginations and inspire them to delve deeper into the world of percussion. A massive amount of percussion instruments for the money. Wonderful rolling plastic tub to store them all in. The durability of some of the items might result in a few being replaced after a class of enthusiastic nippers get at them! The main problem with percussion instruments found in schools these days is that they end up totally brutalised by overzealous kids. After many hours of heavy use, they are often left split or broken, devoid of any tone and usually only fit for the bin. 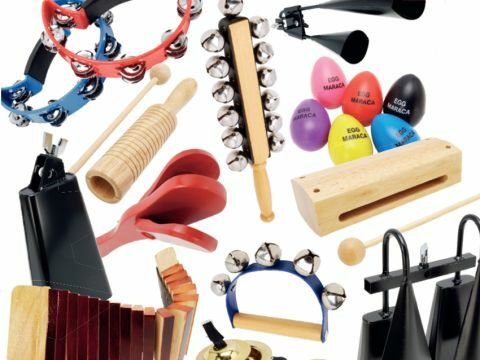 Percussion instruments seem to be more open to attack than other instruments, from kids who think that they know what to do, or who simply use them as a cathartic means to vent their frustrations (meaning, ‘hit it as hard and as often as possible until it breaks´). With budgets for most schools not allowing for regular replacement of these instruments, there has to be a strong element of durability to their percussive choices. Peace is well known for producing eye-catching and highly competitive drums like the Peace Paragon Maple Kit, and now it is offering a complete percussion inventory in a rather useful and durable box. So what exactly do you get in the Peace Luxury Percussion Set? No less than 35 pieces of Taiwanese-made percussion and even a couple of plastic recorders (which does stretch the definition of percussion, unless you employ them as novelty beaters!). You get two sizes of mountable black steel cowbells, which sound adequate but would benefit from a little muffling. They complement quite a reasonable-sounding a-go-go bell set (although the mount´s wingnut was on the skimpy side). The heavyweight mountable twin cowbell and a-go-go combination set (also finished in black steel) sounded a little harsh but looked as though it could withstand some punishment. Two steel triangles with thread loops and matching steel beaters are also included and they produce a loud, authentic tone. Muting them is no problem and they´re extremely durable. "The four generic coloured egg shakers were highly durable, pleasing to the ear and, as they are easy to play, should be a hit with all that use them". Peace include two colourful half moon-shaped plastic tambourines, each with eight sets of four jingles. These would work well in a classroom setting as they are light and quite cutting. The black plastic maracas only lasted a few minutes before the top came apart and nearly showered the floor with metal shot, so you should tape the joints up to avoid losing their contents. Two pairs of coloured plastic castanets are included and fastened with an elastic cord; these are certainly durable but don´t sound anything like traditional wooden versions. The four generic coloured egg shakers were highly durable, pleasing to the ear and, as they are easy to play, should be a hit with all that use them. There´s certainly more than enough to soundtrack a Christmas production here, with two sets of sleigh bells and two jinglesticks included in the box. There´s also two pairs of finger cymbals that produce a pleasing shrill tone and a pair of wooden claves that sound reasonable, but might not impress a Cuban. A handheld wooden temple block allows for a much more satisfying clave sound and looks as though it´s built to last. It contrasts the red wooden clapper which is played one-handed and is good fun to play. A loud wooden ratchet will send the kids soccer crazy and a pretty-sounding circular wood chime and clacker will certainly intrigue the little ones. The wooden tone blocks and handheld wooden a-go-go are a different ball game however, with a fairly nondescript sound, but they would suit kids who don´t have a rhythmic bone in their body. They can now join in and feel like they are part of the group, without completely annoying everybody, and go away feeling great about their contribution. Peace include two pairs of nylon tipped drumsticks and a selection of wooden beaters with which to play all the different bits and pieces.